Nodowa, a type of throat and neck guard. lined with kikko armor to protect the neck. of them were sewn to a cloth backing. The armor could be exposed or hidden between a layer of cloth. When worn the manju no wa looked like a small tight fitting vest. of the manju no wa. or kikko (brigandine), these armors or a combination of them were sewn to a cloth backing. and protected the chest area and sometimes the neck and arm pit. Some manchira could be worn over the dou (d?). from the shoulder, the wakibiki was then suspended over the exposed arm pit area. Wakibiki were either worn inside or outside the chest armour dou (d?) depending on the type. Yoroi zukin, cloth hoods with various types of armour sewn to the cloth. Kogake, armored tabi, a kind of sabaton that covered the top of the foot. these could be made from bamboo or leather. Hachi gane/hitai ate, various types of light weight, portable, forehead protectors. or hidden between layers of cloth. 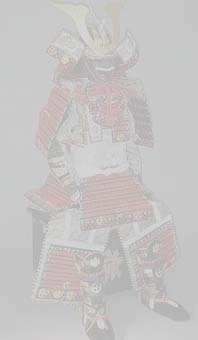 Yoroi hakama, pants covered with various types of armor, the armour could be exposed or hidden between layers of cloth. Fundoshi, a simple loin cloth. Kyahan or kiahan, tight gaiters made of cloth which covered the shins. Hakama, a type of pants worn underneath the armour, hakama could be long or short like the kobakama. Shitagi, a shirt worn underneath the armour. Tabi, a cloth sock with divided toes. Waraji, a woven sandal also known as zori. Kutsu, short riding boots made from leather. Yugake, gloves that were worn under the kote. Kegutsu, also known as tsuranuki, short leather shoes trimmed with bear fur. Sashimono, a small banner that is attached to the back of the dou (d?) by special fittings. Its purpose was to identify the wearer as friend or foe which was essential in the chaotic confusion of a pitched battle melee. Horo, a cloak reserved for prestigious, high-ranking samurai. It provides additional protection from arrows. Agemaki, a decorative tassel worn on the back of some dou and kabuto, the agemaki can also serve as an attachment point. Jirushi, small identification flags or badges worn on the back of the helmet (kasa jirushi) or on the shoulder (sode jurishi). Datemono/tatemono, crests of various shapes and sizes worn on several areas of the helmet (kabuto). Yebira, arrow quiver for ya (arrows).